Although I'm not a coffee drinker, I love the coffee freebies for the Hubby. 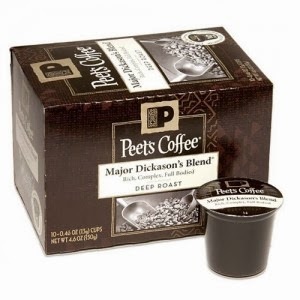 I just snagged a free Peet's Coffee K-Cup and so can you! Sign up for your free sample here. They'll ask you a few super quick questions about your coffee drinking habits and then you'll enter your mailing info. Your sample K-Cup will arrive in 3-5 weeks! Ooh! I love coffee. Thanks for the link!! Thanks for sharing about the free sample! I love coffee! I am hosting a giveaway (posted Monday) and would love for you to stop by and check it out!